One Year Scans Are Good! Great news. I had my one year scans last Friday and there is no sign of cancer. I’ve been looking and feeling great but my history tells me this is no guarantee of anything. The last time I looked and felt great we walked into the surgeon’s office expecting to be told that everything was okay and instead we got the news that I needed a mastectomy. So I am greatly relieved to have the news that my internal health is aligned with my external appearance. 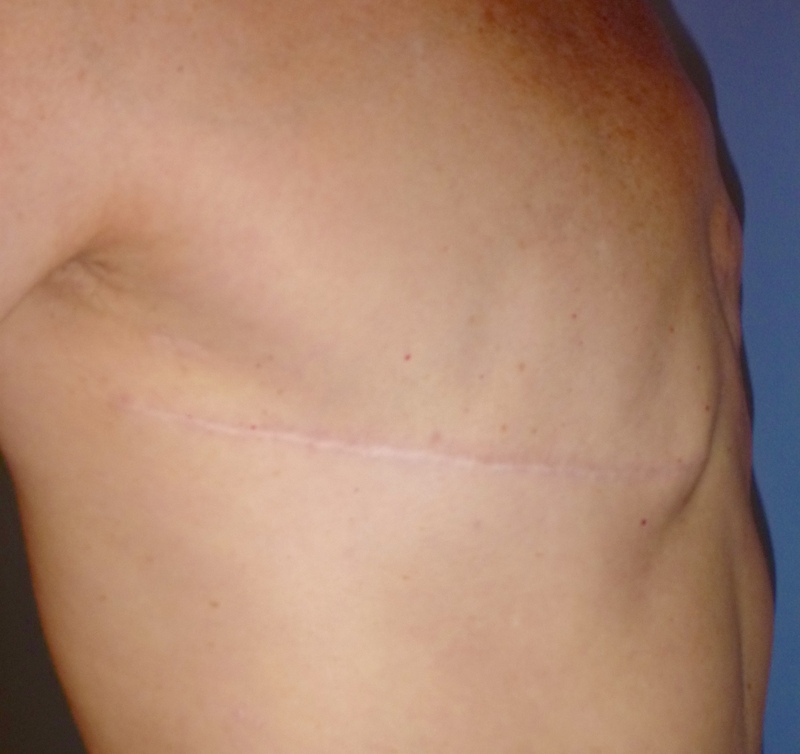 My surgeon decided that the benign lump I discovered several weeks back should be removed. “With your pathology and history there’s no such thing as a good lump.” Fair enough. So yesterday I attended her surgery and their Fellow (someone very close to being a surgeon who serves a kind of apprenticeship for a year) cut the lump out of my chest and stitched it up while we chatted about vaccines, yoga and permaculture. The stitching was the worst part. I had expected it to only involve a couple of stitches and a bandaid. Instead, he decided to use some heavier sutures to make sure it all stays stitched because my tissue was irradiated as part of my treatment and this makes the tissue fragile. Then there was some top stitching with a finer thread. All while fully conscious. I’m surprised I didn’t go into shock. I think it’s just one of the many changes that’s happened as a consequence of my treatment. I’m now a lot more at ease with medical procedures, blood and having bits of my body removed. Still, it was definitely a surreal experience. 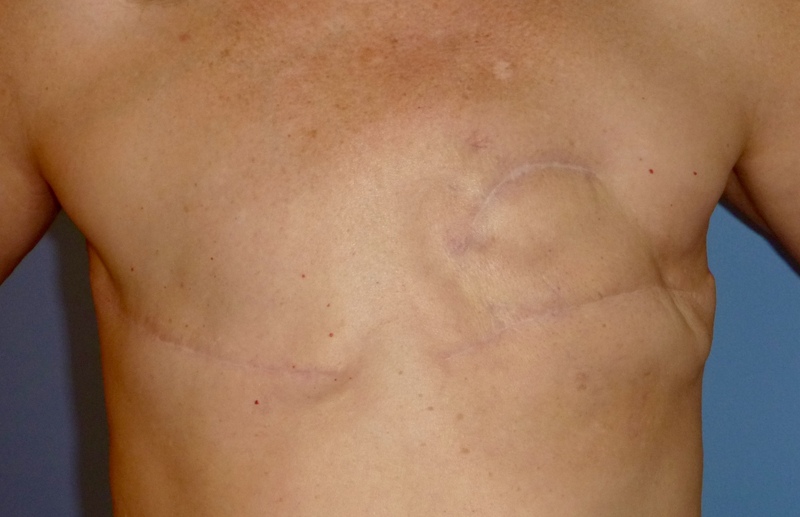 When he finished he explained that he’d made the incision a bit larger than it needed to be so he could join it on to the smaller of my scars ‘for a better cosmetic result’. Seriously? Have you seen the pictures of my chest? I’m beyond worrying about how pretty it all looks. 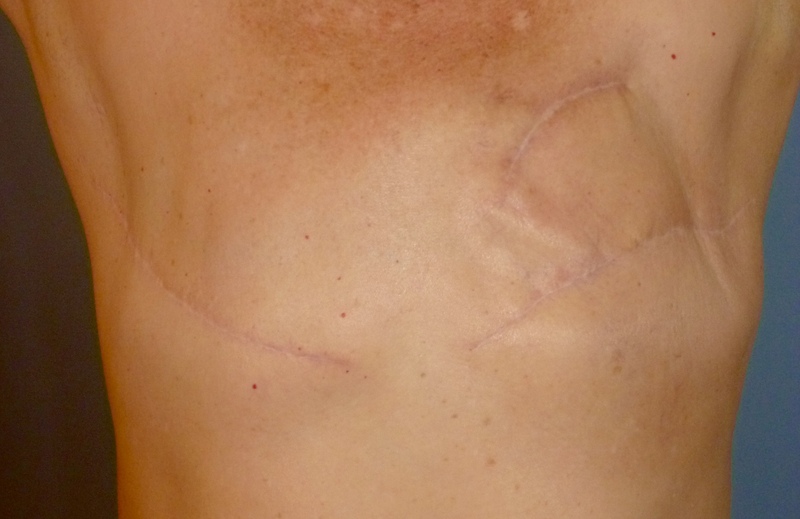 I wish he’d listened to me when I said I wanted the least amount of surgery and that I didn’t particularly care if I had a third scar. Apart from really not caring so much about appearance, the scar he’s joined it to has already been opened up twice and the last time I had problems getting it to heal again. I’d really prefer he’d left it alone. I suppose it’s possible that ‘appearance’ includes avoiding puckering, in which case I’m grateful. I don’t wear a lot of skin tight clothes (except for yoga) but not having odd bumps on my chest would be my preference. I understand that surgeons are trained to give the best appearance possible, and I applaud this shift. 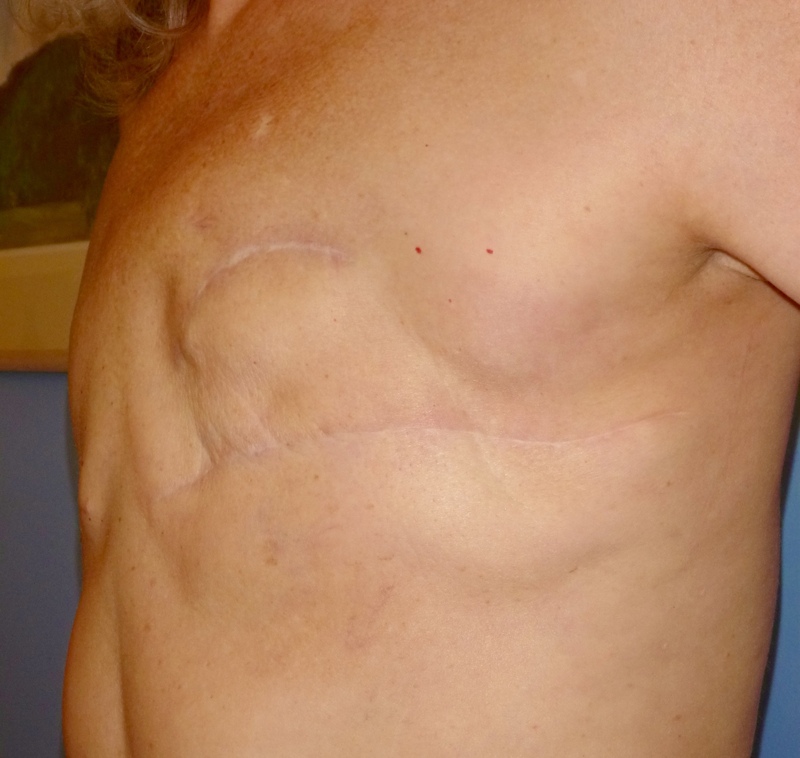 I used to be that a mastectomy involved heavy scaring and extensive skin grafts. Nobody worried too much about what we’d look like afterwards. I also know they often deal with patients that say they don’t care about something only to discover post surgically that they really do. It’s all about communication and taking a bit of extra time. The lump will go off to pathology, just to conduct a routine biopsy, but even looking at it he was happy that it’s extremely unlikely to be cancer. One year down and four to go.